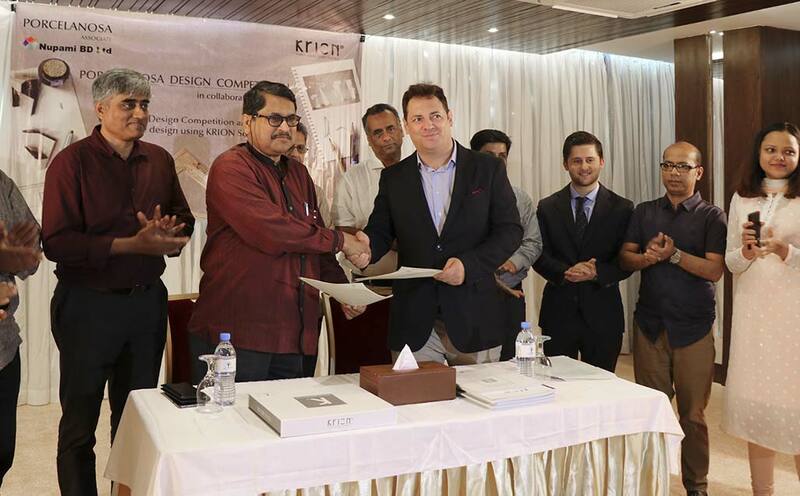 The Institute of Architects Bangladesh (IAB) and Nupami BD Limited have signed an understanding agreement to organise a Design Competition, with the theme of “Units created with the Solid Surface KRION®”. Mr Aritz Izura, Director of Operations at Nupami BD Limited and Ar. Kazi Golam Nasir, President of the Executive Board of the Institute of Architects Bangladesh (IAB), signed the Memorandum of Understanding on behalf of their respective organisations at the Six Seasons Hotel, Dhaka on Saturday the 15th of July. The joint initiative has the objective of highlighting the uses of the solid surface from PORCELANOSA Group, KRION, and presenting the material to design professionals from all over the country. Nupami BD Ltd was founded in 2013 with partners from Spain, to become the official Porcelanosa Group distributor in Bangladesh. One year later, Nupami presented KRION in Dhaka, and in a short time it became one of the favourite materials of architects and designers. The dates and conditions for participating in the competition will be announced on the public platforms of both collaborating parties.